And I’ve also been tossing around the hooks to develop some new designs. 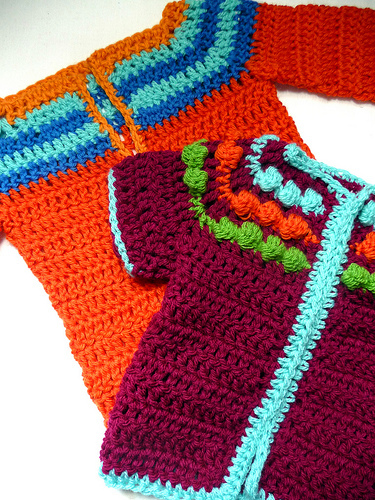 In the back of my head, I’ve been thinking about selling my own crochet patterns on my website. In reality, the motivation is lacking. My head has been exploding with ideas but I haven’t had time to work on any of them, so we’ll see if that goes anywhere, but don’t hold your breath. There is just something I really love about seeing my work in print, and part of it has to do with the someone else who handles the photo shoot, tech editing, diagrams, and layout. Realistically I could do almost all of those things myself but I like letting someone else do it. Since I don’t have much to show you in the way of personal projects, how about a quickie roundup of recent published work? Yes, that’s right, projects and writing you can read in a real magazine!! Things are not looking great for magazines. as I’m sure you’ve noticed. I feel lucky to continue to be able to design and write for some of them, and at the same time, I’m worried about making ends meet this way for very long. Let’s be realistic: the ends were barely meeting when things were going well (it took me a long time to confront my taxes this year!). But, I have a feeling that everything will work itself out. Still, it’s disheartening to see more magazines bite the dust. Let’s celebrate those that are still here– on to the projects! 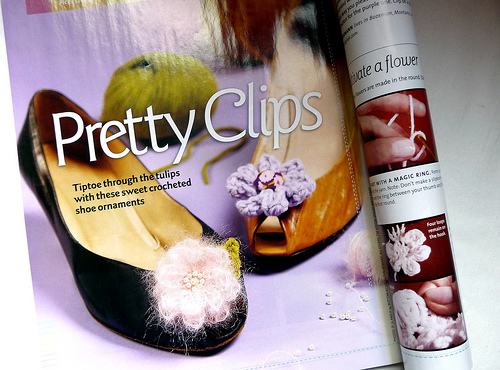 Here’s a fun and quick project you can make from scrap yarn: Shoe clips! I love the versatility of being able to change out the embellishments on shoes, and as someone who, like an old lady, buys multiple pairs of the same shoe when I find one that’s comfortable, these are my sneaky way of feeling like I have more than one style of shoe. You can find these and many more cool projects in the most recent Restyle issue from Craftstylish (still on newsstands, or available online). 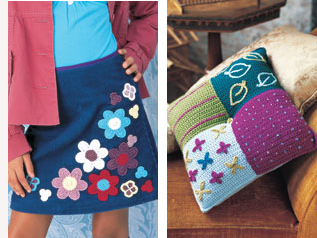 And here are 2 more fun things to hook, from the March/April 09 Crochet Today: A flower embellished skirt and an embellishment sampler pillow (links go to Ravelry pages). I had so much fun m aking the skirt because I ended up having to sew it myself- sometimes it can be so hard to find plain things in the stores. And the pillow takes you on a fun little trip through several surface embellishments including embroidery, beading, and cross stitch. It’s accompanied with step by step photos as part of the Crochet Class article. There are so many possibilities for surface embellishment, so feel free to go nuts with the basic information. And last but not least, check out Make for an article I wrote about a local glass artist, Wes Fleming. 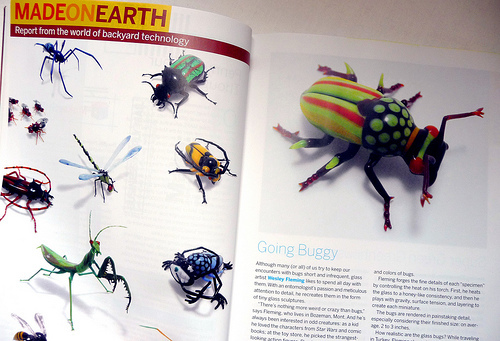 Stated simply, Wes makes bugs from glass. I got to go to his studio and interview him a few months ago, and these tiny little sculptures are truly stunning. I offered to bring him some of the bugs I find in my house (not as stunning, since they move and creep me out) for inspiration purposes, but I think he has enough people bringing him gross things. This weekend I hope to get some deadlines out of my way and then get to work on my Patchwork Swap package. Hope you all have some time for crafts this weekend, too. Hi Linda: Just putting the pieces together here - was speaking w/ Candi Jensen and she mentioned your new book - then I thought - I know that name and now I am just discovering your blog. And then I read about the Adorn piece! How the heck did you go from NYC to Montana? I thought western Mass was a stretch! Good luck with all you are doing - it's tough out here but it keeps us on our toes! Thanks for linking my french knot video over at CraftStylish too! I just did a crochet flower one too. Got some others in the works! totally missed out on the swap.....because i, too, am playing catch up! bummer! hope all is well with you, linda. I LOVE the Leaf & Bean! Best coffee ever. Do you work at the yarn shop that Shona Smith co-owns? She is such a lovely lady. I really should be spending more time there. After all, it's just around the corner from my favorite haunt, the Leaf and Bean!